A trampoline is a versatile and fun equipment, whether you are using it to train budding gymnasts and athletes, or just for kids to have an enjoyable time. It does not require a lot of operational skill or supervision provided you set it up according to instructions and ensure the safety of the jumpers. Trampolines are a rather heavy investment, especially if you are buying one that assures quality and durability over several years. You would want your carefully selected trampoline to give you maximum utility before it is finally time to bid it goodbye. However, trampolines are quite prone to damage, deterioration or even disappearance – the last one a very real threat, particularly if your trampoline is kept in the outdoors and your region is known for storms, hurricanes or high-velocity winds in general. Users often lose trampolines to strong winds, which can carry the frame as close as the neighbor’s yard and as far as a hundred feet from where you had originally placed it. Trampolines are essentially large pieces of fabric stretched across a metal frame, and tend to act in the same manner as an umbrella in a storm – there is no knowing which way it could turn. At best, a flyaway trampoline could find a new home to settle down during a storm. At worst, it could hit someone and injure them, or hit something and indirectly cause any number of freak accidents. There is a risk of an airborne trampoline ending up between power transmission lines, which might cause a small fire or even a full-blown grid failure. Therefore, it is essential that when you set up the trampoline, you also take measures to anchor it to the ground. If you are certain that your trampoline will not be moved from the presently intended location throughout the duration of its use, you can dig narrow holes in the ground, place the trampoline such that its legs fit snugly in the holes and pour in cement. This method secures the trampoline against moderately strong winds. However, the large surface area of the trampoline mat offers resistance to the wind. When the wind is unusually strong, it can cause the rectangular, oval or circular frame to break away from the leg joints and become airborne regardless. This method can therefore be used only in areas of low to medium wind velocity where the trampoline has a fixed location. Anchoring kits are basically a collection of rods, coils and straps to secure your trampoline firmly in its position in the event of a strong wind, without jeopardizing its structural integrity. Some anchoring kits are simply composed of straight iron rods that pin the trampoline legs in the ground. The problem with these rods, however, is that while they weigh the trampoline down, they cannot withstand very strong winds. A sufficiently strong can simply get the trampoline airborne. Straight, smooth rods have no traction in the earth and are therefore not a great choice if you live in an area with fast-moving winds or hurricanes. Another kind of anchoring kit consists of coiled metal rods. These create a much better grip in the earth and are not easily dislodged by strong winds. These are often complemented by ropes, chains or straps which offer additional support to the entire frame in the event of a storm. Anchoring kits afford you the portability that cementing the trampoline legs do not. In addition, there are many varieties of trampoline anchors that are available in the market. You can choose a kit that is provided by manufacturers of the trampoline you purchase, or mix and match with different accessories that are better designed to meet your requirements. You might see a range of anchoring kits in different shapes and sizes, having different components in one package. To use it effectively and understand how to actually use one on your trampoline, read on. 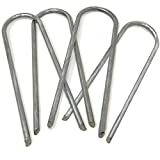 These are metal objects which act as pins or screws and go into the ground to offer the trampoline a solid foundation. The area where these are meant to be fixed might need softening before the anchors are inserted, depending on the sharpness of the anchor end and the kind of soil. Sandy or loose soil lends itself easily to insertion of anchors. However, the grip is rather shaky, and it is therefore advisable to use spiral anchors if the soil where the tramp set is to be fixed is of this variety. Straight anchors only need to be kept over the leg tubing of the trampoline and rammed into the soil, effectively forming a brace or a staple of sorts over the trampoline legs. The spiral variant often goes beside the leg support, connected to the metal frame by clamps and straps. Generally made of nylon, these are simply belts that connect the metal frame of the trampoline to the spiral screw. The straps go around the circular or rectangular metal pipes over which the trampoline mat is stretched. They are then connected to the clamps which are made from either high-grade plastic, fiber or corrosion-proof metal. These are then connected to the head of the spiral screw that protrudes out of the soil. The length of the straps is often adjustable to accommodate different sizes of trampolines, making the spiral anchor set a more versatile and reliable alternative. Straight anchors can be fortified by using ropes or chains that offer additional security in inclement weather. If there is a supporting pole or a pillar close to where the trampoline is placed, some ropes or cables can also be used to leash the trampoline to it, although it is not suggested to use this method in isolation. As we have mentioned in the earlier section, trampoline anchoring kits come in a variety of designs. Here are some of the most popular ones. With a minimalist design that also offers you versatility, the Tie Down 59070 is a popular choice for trampoline anchoring. Consisting of four 15-inch eye anchors with 4″ helix, eight ⅛-inch galvanized cable clips and a 50-feet galvanized steel cable, this has a design that offers great security against strong winds to your trampoline as well as other objects you might want fixed to the ground. The high quality galvanized metal is rust-resistant and sturdy. The spiral at the end of the anchors offers a firm grip on the ground. Performs well even in very windy or stormy weather. The price is rather high compared to other kits. Twisting the anchors in the ground requires considerable effort. If you can spend extra for a product that can work for a number of objects – trampolines, patio furniture, tents – and provide reliability and durability, this is the product for you. Anchoring kits with straps offer you the flexibility to use them across trampoline sizes. Whether you have a small 8-feet one or a full-blown Olympic size, the SkyBound Heavy Duty Trampoline Anchor Kit works for all trampolines. The package consists of four 8-feet nylon straps, clamps and four spiral-shaped anchors with black coating. Black coating protects the anchor metal from rusting. The spiral shape of the anchors holds firm against the soil and resists upward pull in the event of a strong wind. The nylon straps are adjustable and can be used for securing trampolines of any size. The screwing-in of the anchors takes considerable time and effort. SkyBound Heavy Duty anchors are great value-for-money and make all the effort taken in screwing them into the ground worth it. These anchors have demonstrated ability in holding trampolines down in the roughest of weathers, even hurricanes and are a very good choice if you need complete peace of mind. Skywalker is one of the most well-known brands when it comes to trampolines and its accessories. Its trampoline-anchoring wind stakes are easy to use and offer basic support against moderate winds. These are 12-inch long and can clamp down any kind of trampoline with a leg support width up to 2 inches. Fits any trampoline with leg diameter up to 2"
The galvanized steel anchors are rust-resistant. At 1.1 pounds, these are very light, making them ideal for portability. These are very easy to set up. The ends of the stakes might need sharpening to penetrate the ground. If you need an economical option that provides basic stability to your trampoline set, you should go for the Skywalker Wind Stakes. Another well-known name in trampolines and their accessories, JumpSport offers high-quality anchor kits that complement their excellent products. 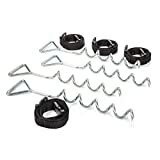 The JumpSport Trampoline Anchor Kit consists of four spiral screws and straps for securing your trampoline to the ground. 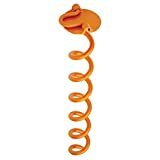 The 16-inch “corkscrews” go nearly a foot into the ground, offering a solid grip in the soil. The spiral design is ideal to hold the trampoline firmly against the wind in any direction. The straps are meant for heavy loads and can resist very strong winds. They are difficult to remove if you plan to move your trampoline around for transport, lawn mowing and so on. The anchoring kit is priced on the higher end compared to other kits. These JumpSport anchors are so efficient that it is difficult to remove them intentionally. These have been shown to withstand strong winds and hurricanes, and if you don’t mind the price, are the most reliable trampoline anchors you can purchase. Spiral trampoline anchors are often rather difficult to insert and remove. If your lifestyle is such that your trampoline requires constant moving around, you want anchors that can be removed and fixed without much effort, but still deliver in rough weather. Pure Fun Heavy-Duty anchors come in handy in such situations. The anchors are made of corrosion-proof galvanized steel. They are 12 inches long and 2½ inches wide, making them suitable for trampolines with leg tubing width up to 2½ inches – which means practically all sizes. The ends are tapered and hook-shaped to bore into the soil easily, irrespective of the kind of soil. The hooks also latch on to the earth, providing a firm grip. The U-shaped arches are flattened to maximize hammer impact while clamping down. Might not be suitable for very stormy weather. If the soil is very loose or sandy, the anchors might not be as effective. Easy to use and remove, the Pure Fun trampoline anchors are ideal for clamping your trampoline down on breezy and normal, calm days. The price is also suitable for most budgets. 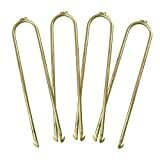 If the weather is too rough, however, these anchors are still useful thanks to their ease of removal. This is not a specialized trampoline anchor, but can be used as one, if a set of four or more units are bought together. While this variant of the Liberty Hardware Spiral Anchor is 16 inches in height, there also are 8-inch and 10-inch options available, although those are not recommended for clamping down trampolines securely. The spiral screw is powder-coated to offer protection against rust. The vivid color helps with effortless visibility. The anchor head has a foldable ring that helps with easy removal. The screw-in is flush with the ground, which means there is no obstruction and it has an overall clean look. Available only individually and extra units and straps have to be purchased separately. If you don’t mind spending extra for a set of anchors that serve you well not only for trampolines but also camping equipment and storm prep in general, these anchors are an efficient and aesthetically pleasing option. If you want the stability of spiral anchor kits minus the slightly higher demand that it typically tends to have on your wallet, go for the Kangaroo Hoppers Heavy Duty Anchor Kit. It is composed of four galvanized steel spiral screws that go deep into the ground, along with strong nylon straps for firm support. Well-designed spiral screws that go 13 inches into the ground, with triangular heads for stability. The shape resists upward pull, hence providing resistance to uprooting. The nylon straps tend to fray with continued use. Not suitable for very strong winds. This product by Kangaroo Hoppers is a budget-friendly spiral anchor kit which can be used for general stability of your trampoline. However, if you live in an area frequented by stormy weather, you might want to look for a better option. Trampolines are a versatile and generally durable sporting equipment. However they are a major, long-term investment and also need regular maintenance and upkeep. Trampolines are prone to flying away with even moderate winds if not fixed securely and can be potentially hazardous if airborne. It is therefore necessary that trampolines are anchored to their position either temporarily or permanently, depending on the kind of usage. Permanent anchoring can be done by digging narrow holes in the ground to accommodate the trampoline legs, and then filling the holes with concrete. For more temporary solutions, there are a number of anchoring kits in the market that cater to different needs. Trampoline anchors can be either straight or coiled. Straight ones tend to be easy to fix and remove, and are best suited for situations where mobility is prioritized over solid support. It is because the straight surface does not offer sufficient grip against very strong winds, and can come straight off if the force is great enough. Spiral anchor kits, though relatively more expensive and labor-intensive, are preferred in areas with high wind velocity and frequent occurrence of hurricanes. The spiral body of the anchors holds on to the soil, offering strong resistance against the wind even in stormy weather. This variant is therefore suitable for situations where the trampoline does not need to be hauled around a lot, and weather or lifestyle conditions do not demand the quick dissembling of the tramp set. Trampoline anchoring kits are easily available and can be used not only to secure trampoline sets, but also other objects like patio furniture, tents, garden benches and so on. The weather can be often erratic, and even if you receive a fair warning of an approaching storm, it is quite likely that dissembling the trampoline in your backyard would be the last thing that occurs to you in those circumstances. Assuming that you have a weatherproof trampoline, it would be a major loss and potential accident risk if the trampoline is not clamped securely to the ground with reliable accessories. Therefore, while some of these might appear rather expensive as outdoor accessories, it is always advisable to invest in high-quality products. This allows you to benefit from their reliability and versatility, rather than making cheap purchases and then falling into a vicious circle of repeated purchases, dissatisfaction or worse, a flyaway trampoline.